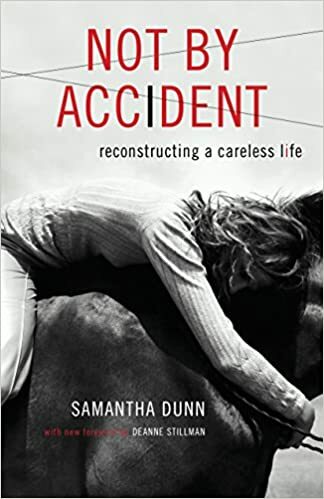 I just started reading NOT BY ACCIDENT by Samantha Dunn and I can’t put it down. This happened the last time I read one of her books, FAILING PARIS. I read it so fast I was sad when i finished. The other day I looked on Goodreads for a list of Samantha Dunn’s books and I found out that I have a copy of every book she’s written. I did not know that. Something else I discovered while reading Not By Accident is that she and I have PLACE in common. For starters, Los Angeles but also, New Mexico, specifically Las Cruces — City of the Crosses. She and I have ties in a part of the country that is largely unknown to most people, but when you are lucky enough to see it, it peaceful, enchanting, a sanctuary. I’ve only just started reading this book, but I can say it will be a book I will read again. Her writing is evocative and dreamy, but is also truthful and honest. She weaves in a natural disconnect and numbness in the midst of terrible pain and sadness that is relatable, but also shows us how much we can endure and survive. This book is about how she was tested to and through her limits by an accident that changed her in unexpected ways as she embraced her whole life; the good, the bad, and the ugly. We can all learn from her journey. If you’ve read this book or anything written by Samantha Dunn I’d love to hear your thoughts. Please leave a comment below.